Red Cuillin Walk, Glamaig, Sgurr Mhairi, Black Cuillin, Raasay, Trotternish. The inspiration for a walk can come from many places. Maybe a particularly dramatic photograph of a mountain contained within the pages of a glossy book prompts you to make an ascent. Perhaps it was the sparkling prose of a magazine columnist that tempted you out on an uncertain spring Sunday when your first reaction was to stay in bed. In this case, however, I'll be brutally honest. My round of the Red Cuillin on Skye was inspired by nothing quite so romantic. No, it was a good old-fashioned bottle of beer that had me clambering up over ankle-twisting scree slopes. The night before I set off I spent a very pleasant evening at the Sligachan Hotel bar quaffing Red Cuillin ale, a product of the Isle of Skye Brewery. The award-winning cask ale is brownish red in colour, not dissimilar to the collection of peaks it takes its name from. The nose is malty, with a touch of caramel and some oaty, biscuity notes. On the palate, it is lightly malty and oaty, with a slightly over-stewed hoppy tinge, although it is not especially bitter. A touch of sweetness is also present. Aftertaste is very understated, with a lingering touch of sweetish malt. All I recall is that after one two many glasses (ABV 4.2) a slight headache accompanied me as I set off from the Sligachan campsite the following morning, leaving the road to wander out across a slight slope of heather, heading almost due east. The gradient increases quite sharply as you begin the ascent proper and it can come as something of a shock for heavy, first-thing-in-the-morning legs. Higher up the carpet of stubbly heather gives way to scree and boulders. The route becomes very steep and the loose underfoot conditions can be a bit un-nerving for those who are hitting scree for the first time. But climb on and the 2537-foot high summit of Glamaig, Sgurr Mhairi, is soon reached. Aching thighs will soon be forgotten as you marvel at the stunning views towards the Black Cuillin in the east and the island of Raasay to the north-west. The topsy-turvy landscape of Trotternish, beyond Portree to the north, is also clearly seen on a good day. Look to the mainland and the Five Sisters of Kintail and Applecross are visible. A steep descent south over more scree drops to Bealach na Sgairde and a fairly easy scramble leads on to the ridge, then the top of Beinn Dearg Mhor. Descend from here into Bealach Mosgaraidh - the col above Coire na Sgairde - and a straightforward ascent leads to the summit of Beinn Dearg Mheadhonach. If you've had enough at this point, the long, well-graded backbone of Druim na Ruaige drops at a comfortable gradient to Sligachan. 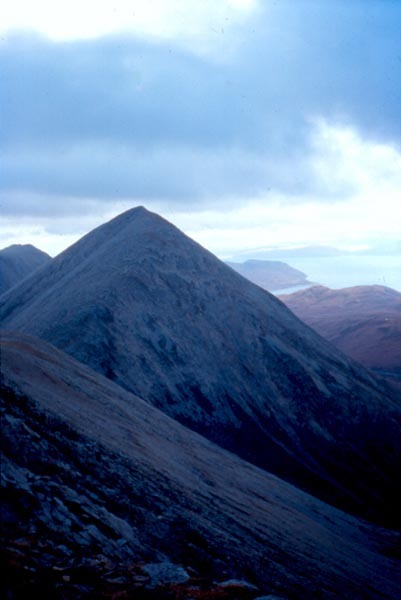 However, to do the Red Cuillin justice you must finish on Marsco. Although not the highest peak in the range, it is the most dominant. Descend the south ridge of Beinn Dearg Mheadhonach to the pass at Mam a'Phobuill. Marsco's summit ridge is reached courtesy of a steep scramble up the left hand side of Coire nan Laogh. Once on the narrow ridge, bear right for the little cairn marking the top. Here your reward for bravery is a particularly fine view east to Sgurr nan Gillean, across Glen Sligachan. Like the Black Cuillin ridge, steep drops provide for plenty of heart-stopping exposure here, so go very carefully. The final stretch of the route back to Sligachan involves a cautious descent through broken cliffs and over rocky scree on the northern ridge of Marsco. Lower down these give way to grass and heather until you join up with the path in the glen below. It runs parallel with the River Sligachan back to civilisation, and, most likely, another pint of Red Cuillin. Map OS Landranger 1:50,000 sheet 32. Start/parking Sligachan Hotel (grid ref 486297). Grading Steep, rough ground suitable for those who enjoy moderate scrambling and have a head for heights. Not for beginners or the faint-hearted.